The Skolkovo company VIST has partnered up with Belarusian earthmoving equipment maker BELAZ to use VIST’s technology to make industrial vehicles made by BELAZ autonomous. In BELAZ’s home city of Zhodzina, 50 km from Minsk, IM watched recently as a 130 t BELAZ-7513R dump truck operated remotely and a fully autonomous BELAZ-78250 wheel loader worked in unison to move mounds of earth. “In the future, the plan is to automate loading work as much as possible,” said Dmitry Vladimirov, director general of VIST Group, the parent company of VIST Robotics. The demonstration was part of VIST’s Intelligent Mine project, a system of using digital technologies to manage production processes at open mines, built around driverless transport, robotics, the Internet of Things, artificial intelligence and predictive analytics. The company says the technology will make it possible to increase productivity by 15 to 20% and enable the mines to work around the clock: while mines can be hostile places for human workers, due to the presence of gases, dust and so on, these are no obstacles to autonomous technology. A remote operator located in a simulator-like cabin – complete with pedals, a steering wheel, levers and several screens showing the equipment’s location and movement in real time via the internet – remains on hand to issue orders at the start of the work, and take additional action in tricky situations if needed. “This will make it possible to manage with one operator for three to five automated loaders,” said Vladimirov. If a 130 t dump truck costs about $1 million, the cost of making it automated adds about 10-12% to that price tag. In 2019, sales are planned to be launched in Vietnam, Indonesia, India and Chile, and in 2020, in South Africa. 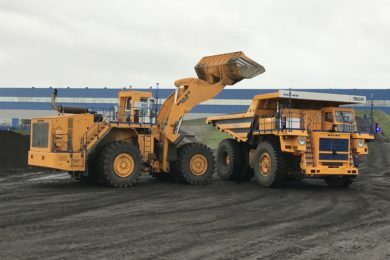 As part of another project that VIST Group is working on together with Siberian Coal Energy Company (SUEK), two BelAZ-7513R dump trucks are due to be sent to the Abakansky mine in the Russian republic of Khakassia by the end of this year, where fully autonomous dump trucks are due to be tested.